Xe-IMG Image Editor v3 supports supports .jpg, .png, .gif, and .swf file types, and imports images from URLs. It has various effects such as zoom, image mask, sharpening, enhancing, and embossing. It’s quite a nice tool with slider controls for sizing and rotating an image. ImageSizer can resize, optimize and rename a batch of .jpg images, outputting them as a single compressed zip file. It also supports cropping of images. This could be be a great tool for people who need to send resized or cropped images in a single compressed file by email. I can think of a few of my own clients where this would be useful! 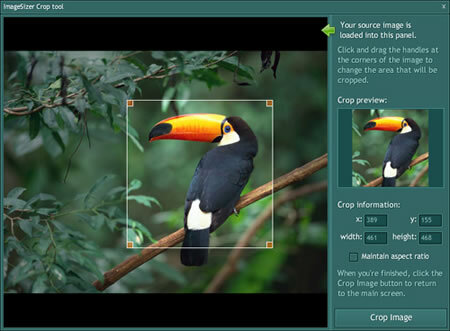 JustResizeIt also has a drag and drop interface so that resizing images is quick and easy. Image size settings can be saved as ‘widgets’ for future use. You can subsequently drag and drop resized images into an email, an office document, or a folder. When I first opened the application I was not sure what to do but the Help page explains everything very well. These applications are designed for specific tasks so don’t expect a huge raft of features. However, if you need to do a simple job like resizing an image, one of these might be right for you. Update: Here’s another option for you. An image resizing tool for Windows Vista and XP. It puts an image resizing and copying dialogue into the right click menu. Thanks for the list, but as I’ve got Photoshop already I don’t quite see the point in using something else. That said, I imagine it would be enormously useful for some clients. I just love Gimp. It is such a powerful open source image tool.. I use it for almost all image work. @Amelia: Agreed. I guess these tools are for quick and simple tasks where Photoshop is not available or if you just want to do a quick task without firing up PS. @Martin: I used Gimp many years ago but have not used it recently. Glad it is still going. Inkscape looks interesting. I’ll put it on my list to try out.